Founder of Laguna Beach Textile Company, Danny Meurer, WG’17, is aiming to secure brand longevity by taking a different business approach to other fast-growing digital retail brands. 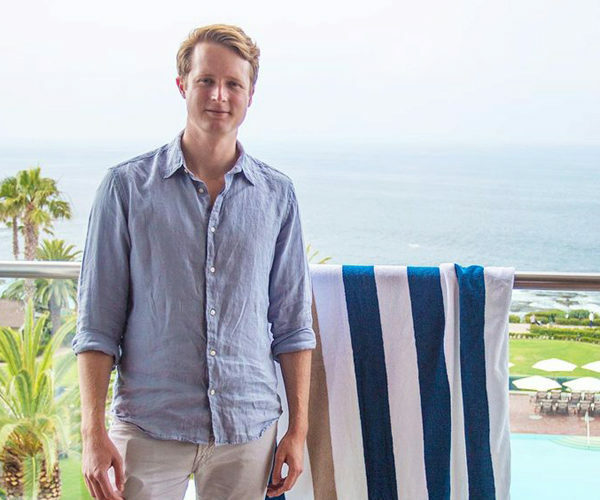 Danny Meurer, WG’17, and his company, Laguna Beach Textile Company, is on pace to do seven figures in sales this year, selling across a variety of online channels. Their cabana beach and Turkish towels are available in Bloomingdales nationwide. The company has five part-time employees, including Danny, but no full-time employees, with Danny having taken a more traditional post-business school job in investment banking after graduating. Laguna Beach Textile Company was a 2017 Penn Wharton Startup Challenge semi-finalist. Here he discusses the differentiators in founding a digital brand with a lean approach. There has been a well-documented wave of fast-growing, digitally native consumer retail start-ups. The list is long and includes Wharton’s own Warby Parker, All Birds and Harry’s, as well as Casper, Dollar Shave Club and many others. The path for many of these companies has been to raise a small seed round from friends and family and then raise larger rounds from venture capital or other institutional investors and heavily invest in customer acquisition and brand-building to grow revenue rapidly. All Birds, for example, founded by a Wharton alum, spent 20% of their initial capital, around $500,000, on building their brand through PR and marketing, and it worked to rapidly grow that business. They then raised a $7.3mm Series A and $17.5mm Series B round following their launch, on the back of their massive revenue growth. We’ve taken a different path, one that has slowed our growth and probably lowered our ultimate ceiling, but hopefully positioned us for longevity and long-term profitability. It also allowed me to take less career risk, while maintaining 100% ownership of the company. We started with an initial investment of about $10,000 for inventory and the related costs of finding a manufacturer, registering an LLC, setting up a website and other startup costs. We’ve relied on marketplaces like Wayfair and Amazon for customer acquisition. These marketplaces are increasingly competitive, especially with low-cost, offshore manufacturers now often competing directly. While competitive and often lower margin, these marketplaces have allowed for a smaller upfront investment and a fixed customer acquisition cost. The only major investment is the cost of inventory, and we have certainty around our margin opposed to the uncertain cost of acquisition of driving traffic to a branded website. Keeping the team lean has allowed us to keep prices lower than they would be otherwise and we’ve found incredibly talented people who work part-time, remotely. We used the website Werk to hire three out of our four employees. The site focuses on quality candidates who need schedule flexibility, largely due to family commitments, and I find that from a talent perspective, offering location and timing flexibility has become a competitive advantage for us, allowing us to find fantastic talent that isn’t available to employers that don’t offer flexibility. We didn’t spend a dollar on marketing for the first two years of business, and instead sought to roll what we would have spent into offering lower prices for our customers and over-delivering on value. We also have been cumulatively profitable, to-date. We’ve made a conscious choice to avoid any external funding and it becomes easier to do that when you’re not running a deficit. When you have a breakeven business with no external investors, the runway is as long as you feel like spending time running that business. With a near infinite runway there are two distinct benefits. First, you get more time to potentially get lucky. With more time you can test multiple types of products over the years and different designs of the same product that may have different consumer responses. It also gives you a chance to get lucky externally, because you don’t know when a large retailer will find your products and want to distribute them or a large media outlet will feature your company or product. The other benefit is there’s a compounding lifetime customer value benefit that comes from longevity. If you make a product consumers love, they’ll purchase from you again and spread word about your product to other people, increasing that customer’s lifetime value. Since our founding, we have sold products to around 25,000 customers at this point and know that many of those customers have come back to purchase from us multiple times and anecdotally, have told friends and family about our products. The lifetime value of our customer base increases with every day we’re in business. Ultimately the right path for a company is highly dependent on the business and the entrepreneur. If you’re the first company selling a product category online or selling a product in a unique way online (glasses, mattresses, wool shoes etc. ), raising venture capital to invest in customer acquisition to capture share as fast as possible makes sense. And if you want to run the business as a full-time career, you’ll probably have to raise venture capital and grow revenue as fast as you can. If you’re selling an existing product sold online, but selling a better product, or if you have a longer time horizon and don’t want to run the business as a full-time job from the beginning, our path might make more sense.